The Rock and Water program is developed by Dutch educationalist Freerk Ykema. Nowadays more than 50.000 teachers, spread over more than 18 countries worldwide, have trained approximately two million children and students. How can Rock and Water help? Rock and Water reduces bullying, increases self-control and enhances social and communication skills. is hard, and feet are rooted to the ground. Physical contact is met with hard resistance. Mental Rock Attitude: You go your own way! You may have exchanged opinions to come to your point of view but now you’re closing off from other ideas. Social Rock Attitude: You close off from opinions and feelings of others. Physical Water Attitude: Muscles are relaxed but alert, breath is in your belly (your centre of action), and feet are in contact with the ground. Mental Water Attitude: Strong awareness of own feelings and ideas but there is also attention toward others. Self-confidence leads to introspection and exchange of ideas with others. Social Water Attitude: Communication and solidarity are at the centre of positive and cooperative relationships. Who can teach Rock and Water? On completion of a 3 Day Rock and Water Workshop with a Master Instructor, you can then deliver the program within schools or organisations to students, parents or clients. It does not entitle you to train other service professionals. We highly recommend completing this 3 day workshop if you are considering implementing the program in your school or service. On completion of a 2 Day Specialised Workshop you can then deliver the program to the students, parents or clients relevant only to that focus area e.g. Girls and Women only, Primary School, or Autism Spectrum Disorders. It does not entitle you to train other service professionals. On completion of a 1 Day Introductory Workshop you can deliver the basic lessons 1-6 to students, parents and clients only. It does not entitle you to train other service professionals. Master Instructor Carl Marshall has received extensive personal training from the Founder of the Rock and Water Program Freerk Ykema. Mr Ykema is the Director of the Gadaku Institute in the Netherlands. Carl Marshall is a Physical Education Teacher at Murwillumbah High School in the far north of NSW. He has been teaching Rock and Water for 18 years. 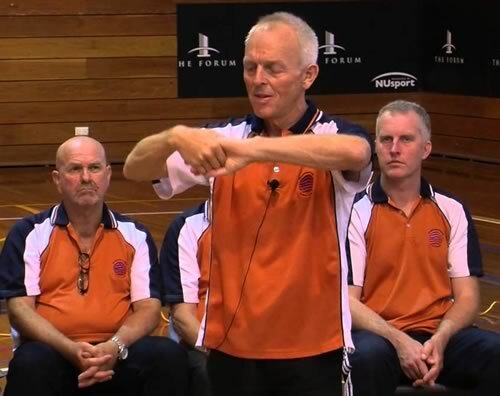 Throughout 37 years of teaching he has taught in secondary schools and colleges in various systems around Australia. He has been a successful teacher working with students in Learning Centres and Learning Enrichment Programs. As an outdoor education teacher for 12 years he has developed and delivered various programs that were particularly successful with otherwise disengaged students.